With exams behind me, it was now time for the final term of my course at Cambridge. Happily, there would be no more sitting in the same cold room day-in-and-day-out listening to lectures. Even more happily, there would be no written exams at the conclusion of the term. Unhappily, by the end of the term a dissertation of considerable heft had to be produced. While the course faculty had proposed possible projects, I had long ago devised my own secret plan. At a welcome dinner way back at the start of Lent term, I had met David MacKay, a fellow of Darwin College. He had shown me Dasher, an interface for text entry that uses a pointing device rather than a keyboard. The basic idea is you write by zooming in on letters which appear in size according to their probability in a model of the English language (easier to see than to describe). My mission was to add speech to the Dasher interface, hopefully producing an interface that was more efficient than using either speech or gestures alone. While I had two supervisors on my project, both of whom claimed to be interested observers, leaving me to run amok. Mostly, things went smashingly- except for the two weeks I spent trying to unsuccessfully reinvent a well known textbook algorithm. That’ll learn me. It was May in England and the weather showed no signs of summer. It was rainy and cool for most of the month. It was a bit of a blessing-in-disguise, I needed to get a good start on my research as I had a lot of visitors scheduled this month. 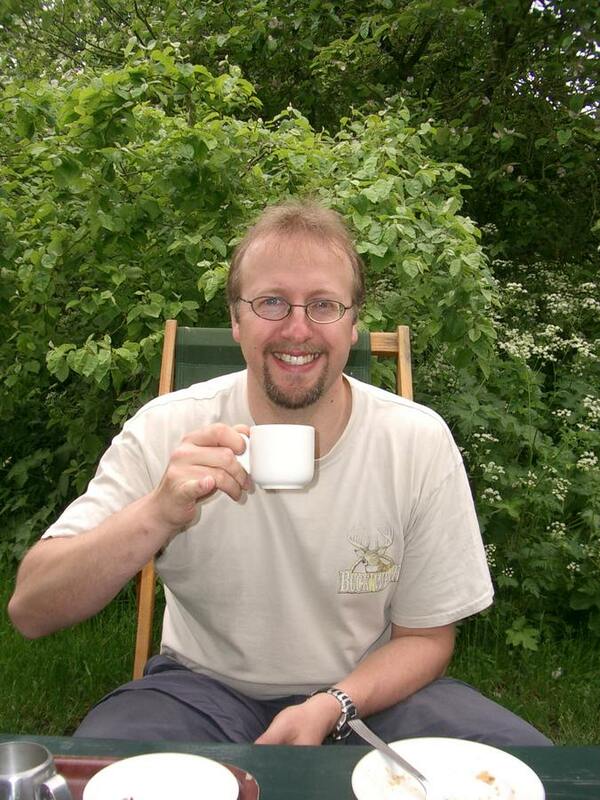 The first was Johan, my good friend from Australia, Sweden, and many points in between. 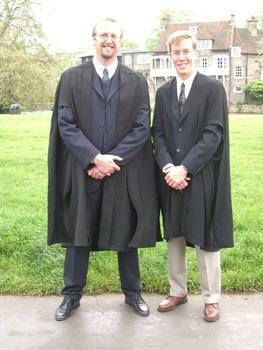 Johan and I in our robes before formal hall. It was my first time hosting a visitor in Cambridge at I was up late the night before reading the Lonely Planet guidebook, studying up on the place I had lived for the last 9 months. You sometimes never take the time out to be a tourist in your own neck of the woods. I took Johan to see all the big name Colleges, using my student ID to bypass the entry fees charged by those big, snooty, rich colleges. I hate those guys and took pleasure in leading Johan around all the places “Private – no tourists”. We got away with almost everything, except for our ill-fated attempt to sneak into Trinity’s student library- we hesitated too much at the entrance and the librarian busted us. 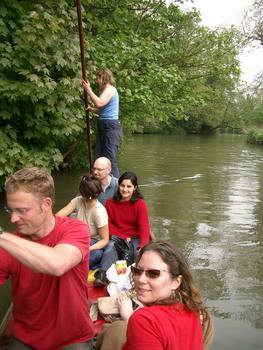 Johan at the helm of a punt. Johan was a natural at the helm of our obligatory Cambridge punt trip. He also fit in nicely as we “snuck” into formal hall at Jesus College, having procured the tickets but having no actual members of the college with us (and only a vague idea of where the dining hall actually was). On Johan’s last day, after a paddling trip up the Cam, we finished up in true English fashion, sipping tea in an apple orchard. 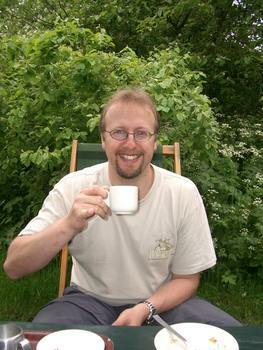 Johan sipping tea at the apple orchard. Towards the end of the month, my Mom, Dad, sister Melissa and brother-in-law Chris all arrived for two weeks. Luckily Melissa had handled all the logistics, booking hotels, tour buses and the like. We spent the first four days in London, seeing all the major sites: the Tower of London, the Houses of Parliament, Big Ben, the Cabinet War Rooms, etc. 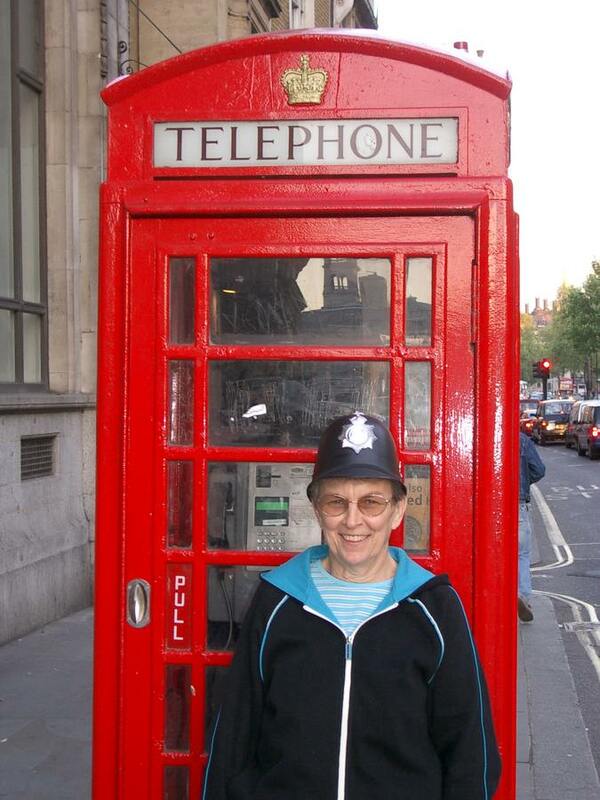 London has plenty to see and we saw a lot of it. 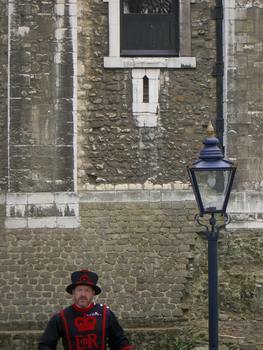 Beef eater guide at the Tower of London. We took a day bus tour of the Cotswolds, an area of rolling countryside northwest of London. We stopped in lot of quaint towns, or at least towns that were probably quaint before 50 bus loads of tourists started arriving everyday. Our next destination on the Melissa-super-tour was Canterbury, home to what is reckoned to be the most beautiful cathedral in England. 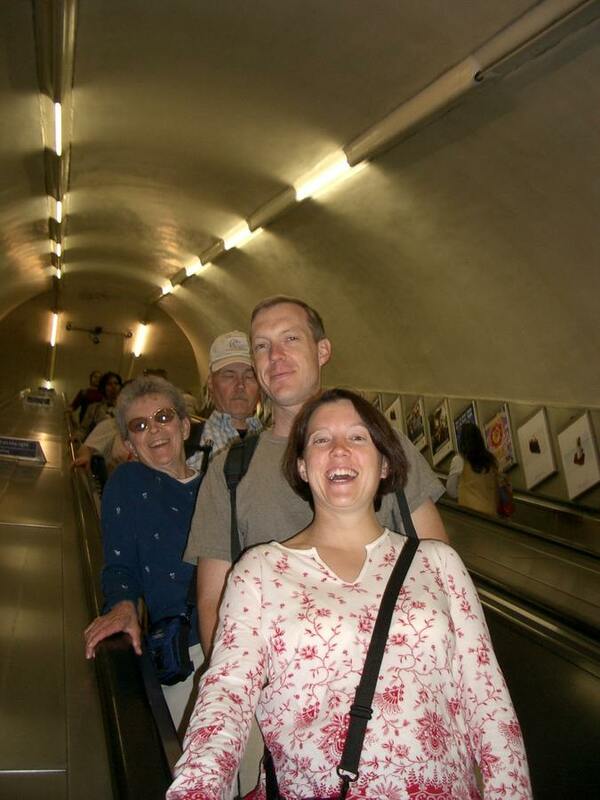 On our way down into the London underground. Having honed my Cambridge tour guiding skill on Johan, I was well prepared for my family’s visit to Cambridge. We took a punt tour, stopping at a pub near Jesus Green where Melissa enjoyed her one pint of beer she was allowed during her pregnancy. We toured the big colleges and took in a choir service at King’s chapel before eating at Darwin formal hall. The outside of Windsor castle from across the street. 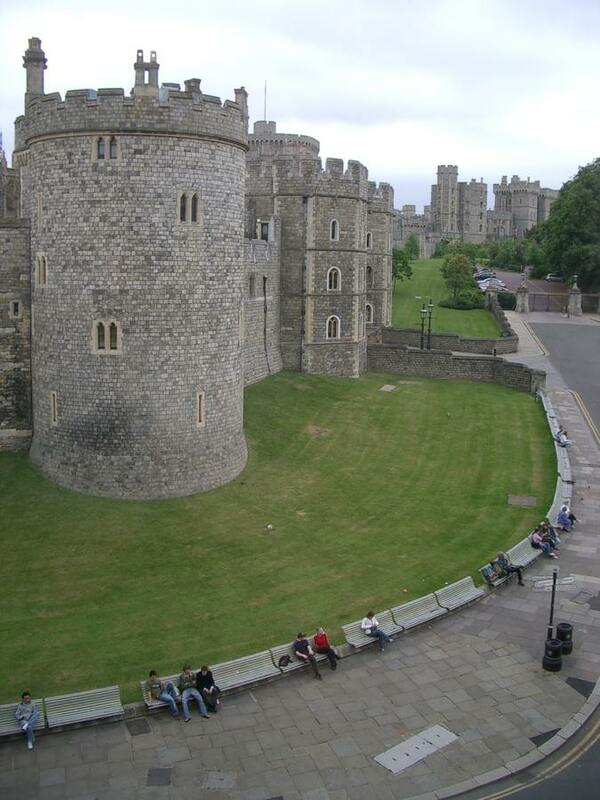 Before their flight out of Heathrow, we squeezed in a visit to Windsor Castle, the official residence of the Queen. We didn’t see the queen, but we saw her doll house, her bed room, her dining room, her collection of china, her collection of silver, etc. While waiting to see her doll house, we got rained on slightly. I realized this was the first rain in two weeks, an incredible stroke of luck given that it rained everyday before and after their trip. After a fantastic meal at a small Italian restaurant, it was time to part ways. My Mom posing as a bobby in front of a phone booth. It was time to turn my attention to my research again. With the days ticking away, I was anxious to start getting some results, any results. But every simulation run seemed to go south, a bug in the program or an incorrect script making days of computation worthless. While writing 15,000 words without results might be possible- it sure as heck wouldn’t be very fun or satisfying. I’ve got to get this working. Next thing I knew, I looked up from the computer and it was the end of June. Things were working better, results were coming in, the writing had begun- time for a break. Midsummer in Sweden seemed like the perfect escape. 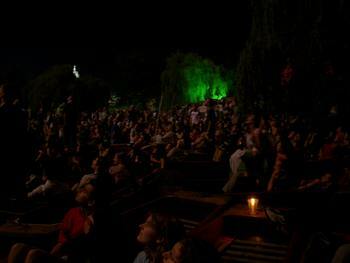 I hopped a cheap EasyJet flight and soon Johan and I were singing at a midsummer party. True to my flunky status in all things Swedish, I was sipping the alcohol I was suppose to shot, and shooting the alcohol I was support to sip. Sea kayak near our campsite in the Baltic. 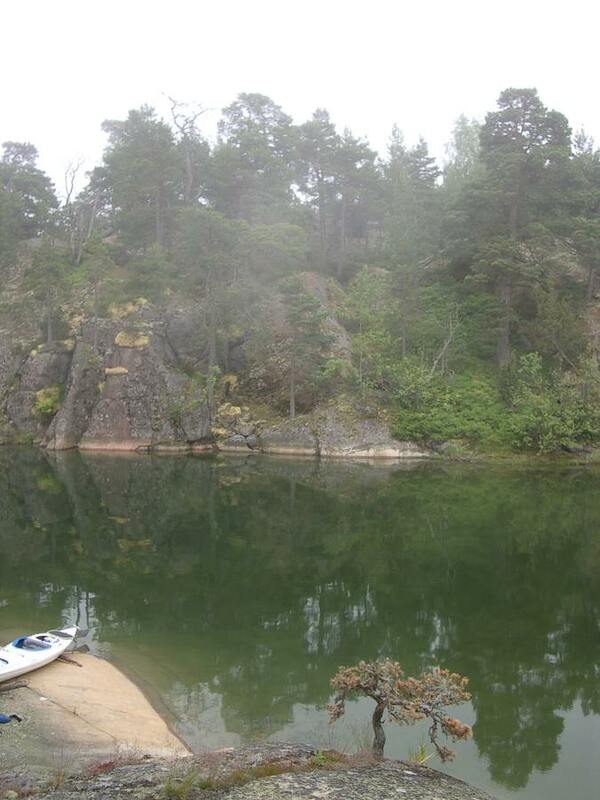 The next morning we left for a sea kayaking trip in the archipelago in the Baltic. While I had never paddled a proper sea kayak before, I reasoned it was like a white water boat, only much bigger, weighed down with gear, and subject to ocean currents and waves. Well I can wet exit with the best of them, so no worries. The paddling and scenery were great and the weather cooperated. We ate well as Johan had brought special midsummer foods like fish balls and herring. After returning from the Baltic, we toured Linköping. I had studied here for a year and the memories of the places and people drifted back to me as we wandered the streets. With very little cross over between my lives in various countries, it can sometimes feel like portions were just a dream. It was nice to ground those memories once again in physical reality. 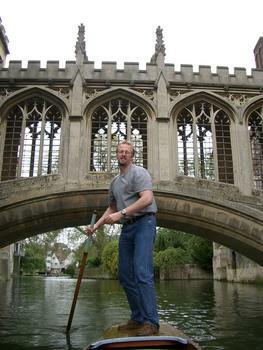 Back in Cambridge, it was hammer-time. I finished up my experiments and started writing in earnest. After a major reorganization of the paper, it was finally looking good. I proofread it, fixed the mistakes, proofread it again, fixed more mistakes, David read it, I fixed lots of mistakes, I proofread it again, arrrgh I’m just turning this sucker in. 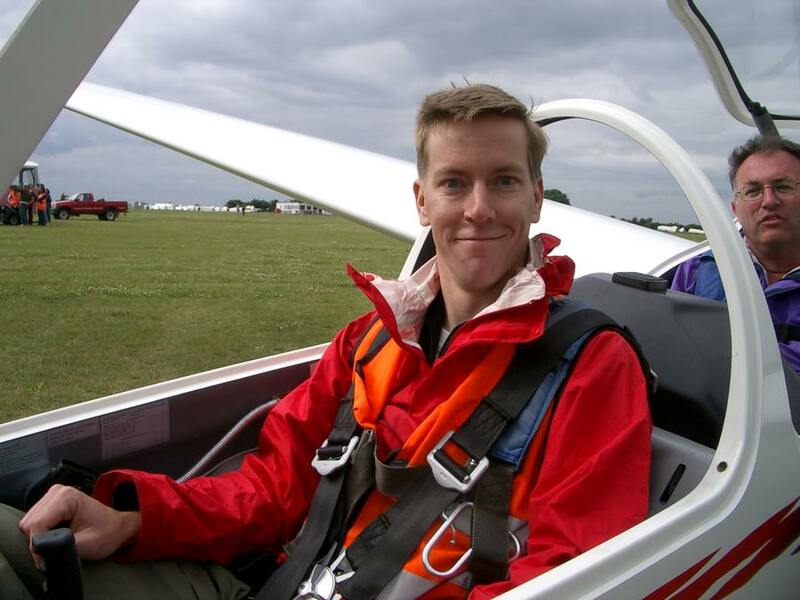 Taking a break from research by piloting a glider. And so ended my M.Phil. As I enjoyed a beer in the sun, sitting on the grass near the Cam, my classmates and I agreed that in retrospect it was a great course, but only in retrospect. We had survived the M.Phil in Computer Speech, Text and Internet Technology. We felt like making t-shirts to proclaim it, we felt like standing in front of the Gates building to wave off future M.Phil’rs before it was too late. With time to spare before my flight stateside, I headed down to Cornwall in the southwest of England. The stated objective of the trip was a photo safari hike for three days along the Southwest Coastal Path. The real objective however was to sample as many pasty pies as possible from the place they originated from (they aren’t in fact Finish). I ate classic pasties, I ate steak and Guinness pasties, I ate cheese and chicken pasties, I ate pasties for lunch, I ate pasties for dinner, I ate pasties until I thought I couldn’t eat another pasty, then I ate another pasty. Boats coving the river during May Ball fireworks in Cambridge. When I wasn’t eating pasties, I was hiking the rugged coastline and taking lots of photos with my big medium format kit. After a long 14-mile day, I completed my hike and pulled into the surfing town of St. Ives. An old Swedish friend Emma was here working for the summer. I had hoped to learn to surf, but the weather was terrible. There isn’t much to do in St. Ives except go to the beach or shop for art, so Emma and I spent the day catching up on old times, having Cornish tea, and yes even a pasty. 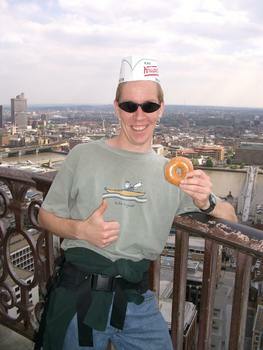 Enjoying a Kripy Kreme at the top of St. Paul's Cathedral. It was now time to pack up my gear in Cambridge, but not permanently. As many of you know, I have accepted a funded PhD position at Cambridge. I will be in David MacKay’s group where I will continue my research on Speech Dasher and other types of new interfaces. So rest assured, there will be many more adventures to come. Stay tuned!